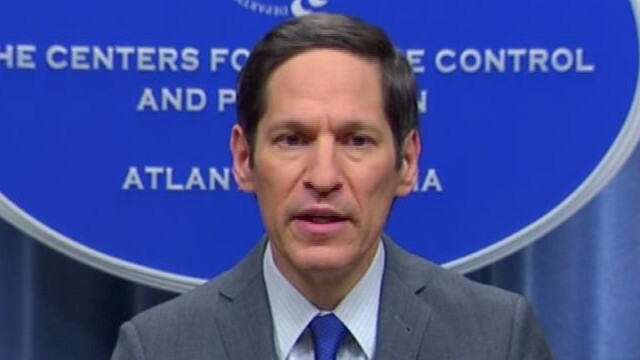 Today on CNN’s State of the Union with Candy Crowley, Dr. Thomas Frieden, director of the Centers for Disease Control and Prevention, spoke to Crowley about preventing the spread of Ebola in the United States and finding a solution to the epidemic. CROWLEY: Joining me now, Dr. Tom Frieden, director of the CDC, who by now has become quite the familiar face. Dr. Frieden, thank you for joining us. Let me just get an update on what you know. Does it remain true that there is this one Dallas case, and that’s the only known case of Ebola in the U.S.? FRIEDEN: As of now, the man in Dallas who’s fighting for his life is the only patient to develop Ebola in the U.S. We know that there are going to be other concerns and rumors, and we will track every one of those down. We want people to be concerned, but appropriately concerned, about people who have had the travel that might suggest or the symptoms that might suggest that they need testing for Ebola. And, if they do, we will get that testing done promptly. And can you tell me — I know that you are now doing contract — that there are people that are under observation who had been in contact with this patient. What is the date after which they are free and clear? What are you using as that kind of initial 21-day period? When does that end? FRIEDEN: Contact tracing is the core public health activity that is stopping this in its tracks in Dallas. It’s a hard job. It’s an intense job. It means developing a relationship. We have got about 50 people, including about 10 who definitely had contact, about 40 who might have had contact. And every one of them will be monitored every day to see if they have fever. If they do, they will be promptly isolated. That’s how you stop it in its tracks. And that’s why we’re confident that we won’t see a large number of cases from this. We are concerned about a couple of family members who had very close contact with him when he was sick. But that’s something that we will just have to check each day for 21 days after the last day of their contact. CROWLEY: So it’s dates from when he went into the hospital, basically, from that day, the 21 days? FRIEDEN: It depends when the contact was. So, if someone had contact with him a couple of days earlier, it would end a couple days earlier. Listen, the White House this week said to us that, at the Centers for Disease Control, you have been working closely for months with state and local health officials. And still we see that it took a couple of days and one kind of misdiagnosis to get this man in the hospital in Dallas. We then see that the contaminated material in the apartment where he was staying stayed there for days, that there wasn’t a real clear way of transporting that once the sanitation of the apartment started. So I think — and what to do with it once they transported it. So I think some of what one hears when people are saying, wait a minute, wait a minute, do they really have control of this, is that those seem to be kind of major mistakes. How did that all happen? FRIEDEN: Ebola is scary. And we understand that people are very concerned. And we’re very concerned. The reason we had some challenges with the medical waste is that’s the first time we have had to deal with that situation, and, just by chance, there had been a glitch in our system to approve, the government system to approve a waste removal company to do that. That’s been resolved. I wished it had been resolved sooner, but it’s resolved. The issue of the missed diagnosis initially is concerning. And that’s why we’re redoubling our work with doctors, hospitals, emergency departments, medical societies, folks who work on electronic health records. We have provided checklists and algorithms and training. I think this is a teachable moment. And, after this incident, I am certain that there’s a lot more concern and attention throughout the U.S. And, in fact, we’re seeing more people calling us and considering the possibility of Ebola. That’s what we want to see. We don’t want people to not be diagnosed. We want people to make sure that people come in, and if they have been in any of these countries within 21 days, and they have got a fever or other symptoms that might be Ebola, immediately isolate, immediately contact the local health department and get them tested. CROWLEY: But the concern, I guess, Doctor, is that it seems so basic, what do you do and how do you transport contaminated material? So, when that is the first thing that slips up in the only known case, that’s when people think, do they really have a handle on this? FRIEDEN: The bottom line here in Dallas is contact tracing. That’s how we’re going to stop the outbreak in its tracks, making sure that every person who had contact with the individual when he might have been infectious is monitored every day for 21 days and, if they develop fever, to immediately isolate them. That’s how we break the chain of transmission and that’s what is going to make sure that we don’t have a large outbreak in Dallas or elsewhere in the U.S. But we remain deeply concerned about what is happening in Africa, not only because of Africa, but because the longer it goes on there, the more it might spread to other countries and the greater the risk to us. So, realistically, we all want to get to zero risk to the U.S. And our top priority is to work 24/7 to protect Americans from threats. We can only do that by making sure that we get it under control in Africa. And we’re beginning to see the response ramping up there. But it’s going to be a long, hard fight. And one of the things that we’re learning now and we learned this week was that it will take several weeks for U.S. troops. The president has ordered, I think, up to 4,000. They have only been able to get a handful there because of some transportation problems, et cetera. Was the West late to this epidemic in Western Africa? And do you see any break in this, or does it — does the problem continue to mount in the three affected — major affected countries? FRIEDEN: We’re definitely scaling up the response. We’re seeing a more rapid, more effective response in different areas geographically of the countries and also in different aspects of the response. But it’s going to take time. The virus is spreading so fast that it’s hard to keep up. That’s why it’s terrific that the president has deployed the Department of Defense there in support of the disease control efforts. This is exactly what is needed. And it’s going to make a difference, but it’s going to take time. CROWLEY: Well, why was the world so late to this? This was — I guess the first case was reported in March. I know you were over there, and came home and rang the alarm bells I think in August, some time. It seems that the West, not just the United States, but the world was really slow to this. FRIEDEN: I think this has been an enormous challenge. We have never seen an Ebola epidemic before in the world. It’s spreading rapidly in urban areas between the three countries. This is the first time. And it really tells us that we need to ramp up our ability to find the problems rapidly when they emerge, to stop them promptly, and to prevent them whenever possible. And that kind of core public health system, the laboratories, the disease detectives, the emergency response capacities, we need to make sure that we have those available in these countries and surrounding countries and anywhere there might be a threat, because, if we don’t do that, ultimately, we’re all going to be at higher risk. CROWLEY: Is it fair to say that, in Sierra Leone, in Guinea, in Liberia, that at this moment Ebola continues to spread unabated? FRIEDEN: It’s — you know, it’s quite different. Each of the three countries has a different pattern of the disease, and even within the three countries, each of the counties or districts have different patterns of disease. And, right now, what we’re doing is moving out from the capital to each of the counties to have specific disease detective trackers. This is the largest CDC response in our history. We have currently 135 people in the field, our top disease detectives going out to counties, tracking cases, making sure that we’re responding effectively, putting out the sparks when it goes into a new area, and trying to cool down the fire at the heart of the forest fire there. That’s what we do to protect Americans and that’s what we do to save lives around the world. CROWLEY: Dr. Tom Frieden at the Centers for Disease Control in Atlanta, thank you so much. Appreciate your time this morning.